Your one stop shop for fast and reliable VPS Hosting. Our plans are listed here below. Give us a call. We will help guide you through selecting a plan. Here is a list of features you get with your VPS server package. Activated Instantly. Get started right away with setting up your server. Install any sort of software on your server. You decide. Ran into a issue with your VPS server? We have backups on hand incase problems occur. Having any issues with your VPS server? We can help you solve them. Security is very important. Your service is always secure when its hosted with us. Not satisfied? We offer you a full refund if you face any issue. All servers deployed and run on OpenVZ virtualization. Keeping your server online 24/7. You have a selection of over 25 operating systems to choose from for your VPS. We give you the options to pick and choose how you please. Control your server with the SolusVM control panel. 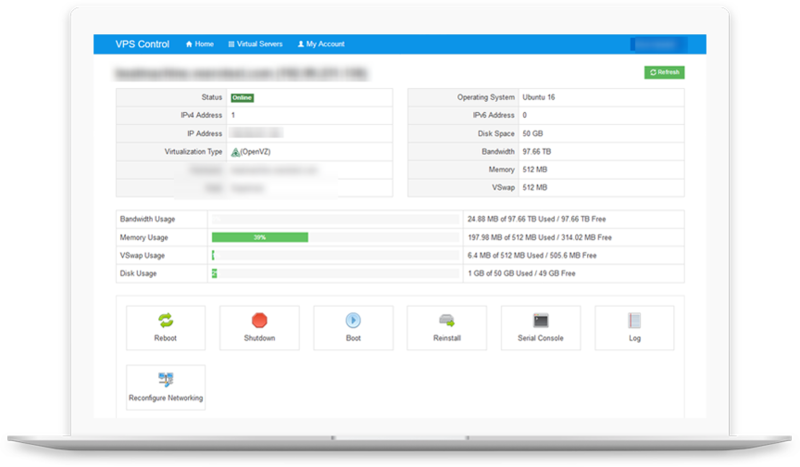 Manage all your VPS servers in one place. Easy to access on the control panel. See how your server is performing. All stats viewable from the control panel. View the terminal with ease. Command and control your server without needing a external program. Here is a list of extra services you can have with your VPS service. Full DDOS protection to protect your server from all kind of attacks. Anytime day or night. Need help with your server? We can assist you with everything you may need help with.